The area around the Rock Creek basin where Kensington is located was primarily agricultural until 1873, when the B&O Railroad completed the Metropolitan Branch which traversed Montgomery County. A community arose where the new railroad line intersected the old Rockville-to-Bladensburg road. This early settlement was first known as Knowles Station. In the early 1890s, Washington, D.C. developer Brainard Warner began purchasing land parcels to build a planned Victorian community, complete with church, library, and a local newspaper. Fascinated by a recent trip to London, Warner first named his town Kensington Park. Upon incorporation in 1894, the town was renamed Kensington. The historic core of Kensington was listed on the National Register of Historic Places, as the Kensington Historic District in 1980. Initially Kensington was a summer refuge for Washington, D.C., residents wishing to escape the capital’s humid summers. As years passed and its residents increasingly remained year round, Kensington evolved into a commuter suburb. The large southernmost section originally mapped out by Warner remains largely unchanged since inception, and is a historically preserved zone. Indeed the only major changes in the town’s basic layout have been the bridging over of the original railroad crossing in 1937, and the extension and widening of Connecticut Avenue, the town’s main thoroughfare, in 1957. Kensington is located in Montgomery County, northwest of Silver Spring, northeast of Bethesda, southwest of Wheaton, and southeast of Rockville. Its latitude is 39°1′48″N, longitude 77°4′30″W. According to the United States Census Bureau, the town has a total area of 0.48 square miles (1.24 km2), all of it land. While the town proper is but one-half square mile in size, the Kensington Post Office services a much larger area and extends into North Bethesda, MD and the Wheaton Planning District. Residents within this ZIP code (20895) generally refer to Kensington as their home town even though they technically do not reside in Kensington. Significant through roads in Kensington include Maryland Routes 185 (Connecticut Avenue), 193 (University Boulevard West), and 547 (Knowles Avenue). The look and white color of the Washington D.C. Temple located in Kensignton, coupled with its location near the Capital Beltway has made it a local landmark. 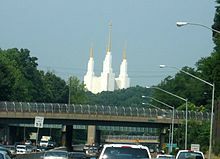 D.C.-area traffic reports often refer to the “Mormon temple” or “temple”.